Peer through the roses into the Maharaja’s atrium. Flycatchers flit between almond and orange blossoms, while pursued insects seek refuge in the spice garden. This most delicate and floral chai diplomatically guilds every sip with aristocratic refinement. 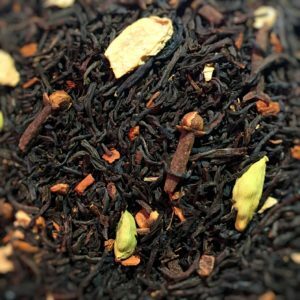 Ingredients: Black tea, vanilla, almonds, cloves, citrus peel, rose petals, cardamom, natural flavour.